Reference number for this case: 22-Oct-54-Quimper. Thank you for including this reference number in any correspondence with me regarding this case. 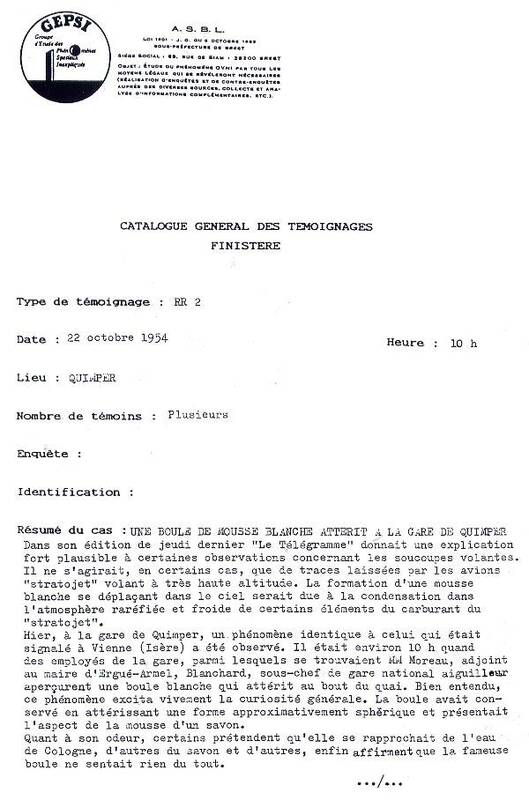 In its edition of last Thursday "Le Télégramme" gave an extremely plausible explanation to certain observations concerning the flying saucers. It would only be, in certain cases, traces left by the "stratojet" planes flying at a very high altitude. The formation of a white foam moving in the sky would be due to condensation of certain elements of the propellant of the "stratojet" in the rarefied and cold atmosphere. Yesterday, at the station of Quimper, a phenomenon identical to that which was reported in Vienna (Isère) was observed. It was approximately 10 o'clock when employees of the station, among which were MM Moreau, assistant to the mayor of Ergué-Armel, Blanchard, national deputy stationmaster pointsman saw a white ball which landed at the end of the quay. Of course, this phenomenon highly excited general curiosity. At landing, The ball had preserved by a roughly spherical form and presented the aspect of the foam of a soap. As for its odor, some claim that it neared Cologne, others said soap and others lastly claimed that the famous ball did not smell anything at all. Finally, when one seized part of this kind of foam in the fingers, it volitilized completely and there remained absolutely nothing of it. The services of the General Intelligence, alerted by Mr. Moreau, came to the location. Luc Chastan indicates that in the Finistère in Quimper on October 22, 1954 at 10:00 "It was approximately 10 when employees of the station saw a white ball which lands at the end of the quay. Of course, this phenomenon excited general curiosity highly. The ball had preserved by landing a roughly spherical form and presented the aspect of soap foam. As for its odor, some claim that it approached Cologne, others soap and others finally claim that the famous ball did not smell anything at all. Lastly, when one seized part of this kind of foam in the fingers, the latter volitilized completely and there remained absolutely nothing of it. The General Intelligence services went on the spot." Luc Chastan indicates that the source is "Les OVNI vus de près par Gross Patrick ** http://ufologie.net." [---] Article in the regional newspaper Le Télégramme de Brest, Brest, France, October 23, 1954. 0.1 Patrick Gross October 24, 2004 First published. This page was last updated on February 7, 2017.